In part 2 of this two-part rhythm guitar lesson video, now available on YouTube.com, Jon MacLennan teaches how to play octave notes in the style of Wes Montgomery. “Here is a nice Wes Montgomery chord voicing for you,” says MacLennan, “C minor seven.” Jon demonstrates how to play the Cm7 (C minor seven) chord voicing as follows: 3rd fret of the 6th string with 2nd finger, first fret of the 5th string with first finger, first fret of the 4th string with first finger, 3rd fret of the 3rd string with 3rd finger, 3rd fret of the 2nd string with 4th finger and first fret of the first string with first finger. “Lots of barring with the first finger, but a great sounding chord,” says MacLennan. “Notice that there is no root in that chord.” Next, Jon demonstrates how to play the octave shapes as follows: for the 9th; 7th fret of the 3rd string with first finger, simultaneously muting the 2nd string and 10th fret of the first string with 4th finger. For the remaining positions Jon uses the same formula with the first finger starting on the associated notes. Guitar TABs are available for this easy guitar lesson at GuitarControl.com. Wes Montgomery was an American guitarist from Indianapolis Indiana. Wes was known for his unusual technique of not using a guitar pick, but rather using his thumb. Over the course of his career Wes played on 34 albums and is considered one of the most influential guitarists of the 20th century. Wes died of a heart attack in June of 1968. 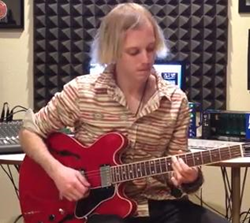 Los Angeles based guitarist Jon MacLennan began his career at the age of 16 and is one of the busiest upcoming session guitarist, artist, composer, producer, and professional educator in LA. Jon has done session work for Julian Lennon, Steven Tyler, and British pop star Jamie Cullum. He has appeared on Disney Channel's “The Suite Life of Zack and Cody” and on the sound track to the movie “Marley and Me 2 – The Puppy Years”. MacLennan earned a bachelor’s in ethnomusicology and jazz guitar studies from University of California, Los Angeles, and has been mentored by Carl Verheyen, Wolf Marshall, Kenny Burrell, Anthony Wilson, Tamir Hendelmen, Jimmy Wyble and Ron Anthony which has made him a highly sought after guitar instructor today. GuitarControl.com is the leader in modern guitar instruction. It’s packed with resources including articles, video lessons, and the best videos in the business for the beginner to the advanced guitar student taught by the best instructors out there. Weather you are into the blues, rock, jazz, metal, folk, or anything in between, they have you covered.